They will be empowered with smartphones and digital devices to provide financial services. IPPB will also facilitate digital transactions and availing benefits of govt. schemes such as Pradhan Mantri Fasal Bima Yojana for farmers. It is a public sector company under the Department of Posts with 100% GOI equity and is governed by Reserve Bank of India (RBI). Function was witnessed at around 3000 locations across the country. 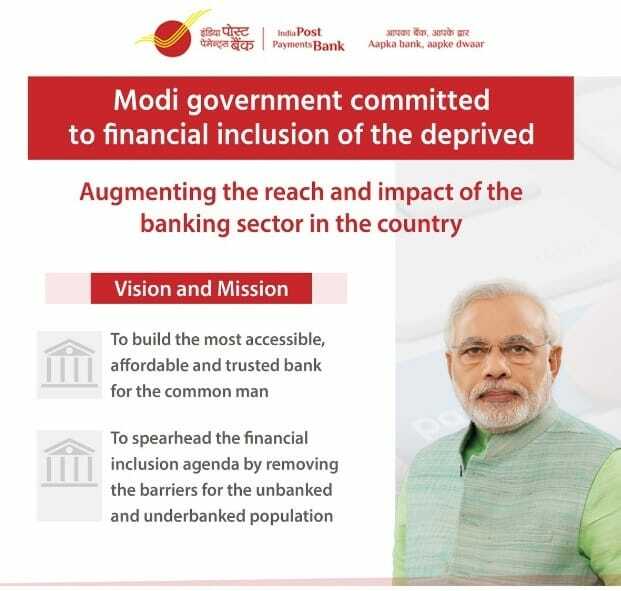 This initiative is to provide boost to banking services to the remotest people in the country. Now the revised cost for IPPB is Rs. 1435 crore. From 1 September 2018, IPPB branches are opened across 650 districts today to achieve this financial inclusion. PM said that postman has been seen as a respected, trusted and accepted person in any village. Govt. is focusing on making reforms to existing frameworks and structures in accordance with changing times. 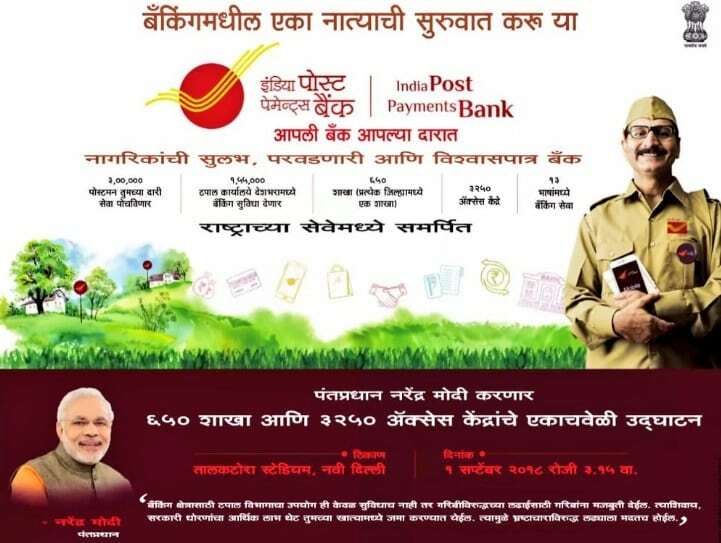 Now around 3 lakh postman will deliver banking services to the people at their doorstep. This move is to resolve the problem in banking sector which exists due to indiscriminate loan advances. Existing loans are being reviewed and a professional approach has been adopted. PM Modi said that the central govt. has also approved Fugitive Economic Offenders Bill to take strict action against bank defaulters. Moreover, around 13 lakh crore Mudra Loans have already been disbursed to the youths of poor and middle class to create self employment. India is consistently advancing on the path of development and excels at World level. This could be seen through the best ever performance of India at Asian Games. India is the fastest growing economy and is also eradicating poverty at a fast rate. Initially, there will be 3250 customer access points and 3,00,000 dak sevaks to provide financial services to every home, every farmer and every enterprise in villages. Govt. is also taking various steps for the welfare of dak sevaks and has accepted long pending demand of increasing salary. 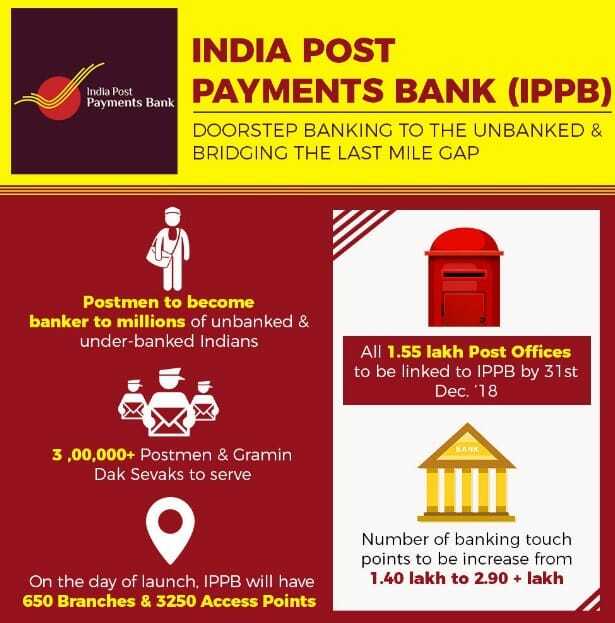 IPPB shall reach over 1.5 lakh post offices across the country till December 2018. Now we are telling you how to open a regular savings or current account in IPPB. IPPB facilitates Aapka Bank, Aapke Dwaar. The main objective is that “Every customer is important, every transaction significant and every deposit valuable”. This will ensure receiving money in fastest possible manner, save money for loved ones or investing for bright future. People can visit the official website ippbonline.com. Then go the “Products” section and then click the ‘Savings Account’ to open Savings bank account and ‘Current Account’ link to open the a new Current Account. 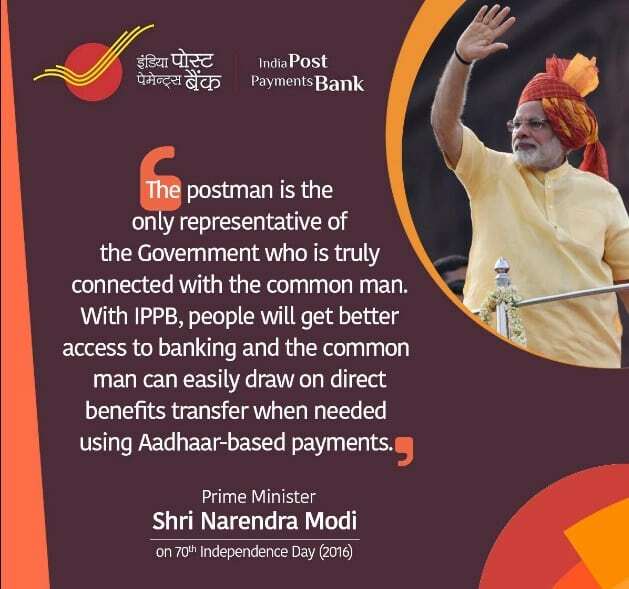 The main features of the regular savings / current account in IPPB are Instant account opening at your doorstep or post office counters, Aadhaar based Direct Benefit Transfer (DBT), Simple & secure, Instant, 24×7 money transfer, Hassle free cash withdrawals and deposits, Convenient way to pay your bills, Simple, affordable and reliable services.